produced by most dentists today. It is the only mouthpiece with this design available without a prescription. What makes this design so special is that it provides the adjustability needed to maintain proper jaw position without fixing the upper and lower units together. Maintaining the normal movements of the jaw such as yawning, swallowing or even talking is important to the health of the TMJ. This is why some mouthpieces can produce more issues with dental occlusion and jaw pain. 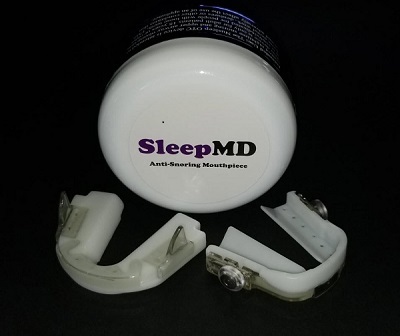 SleepMD’s lower mouthpiece holds the wings that project toward the upper teeth. The upper mouthpiece has the wheels that will interact with the posterior surface of the wings. As you fall asleep at night, your muscles become relaxed and the jaw slightly closes. It is this very moment that the interaction begins and the wings start to guide the lower jaw forward. In this position the tongue can no longer fall backward so snoring and airway obstruction resolve. Injection molding of the inner and outer material is now possible do to design changes. As a result, the plastic parts are more integrated and durable. The changes have allowed for an unlimited array of shape and size alterations to adapt to varied dental structures.